While a tornado partially knocked out at the Browns Ferry reactors in Alabama in April, power began to be restored within a month without incident. The flood waters in the Missouri continue to pose a danger to the Fort Calhoun nuclear plant in Nebraska. As you may know, an electrical fire at the spent fuel pools at Fort Calhoun temporarily knocked out power for cooling, and the operator flooded the containment building. So far, I have seen no evidence of any release of radiation, although there are a number of worrying factors in the form of a “perfect storm” which could – in a worst-case scenario – lead to an accident. “Operations identified a potential flooding issue in the Intake Structure 1007 ft. 6 in. level. The area of concern is a the hole in the floor at the 1007 ft. 6 in. level where the relief valve from FP-1A discharge pipe goes through the raw pump bay and discharges into the intake cell. There is one penetration of concern. Flooding through this penetration could have impacted the ability of the station’s Raw Water (RW) pumps to perform their design accident mitigation functions. “Efforts are in progress to seal the penetration. [Fort Calhoun Nuclear Power Plant’s chief nuclear officer, Dave Bannister] said for the plant to get to a disaster level, floodwater would have to rise three and a half feet above where it stands now. Service in order to try to predict the river’s flow. The flood begins higher up, at places like Dark Horse Lake in the Bitterroots, [Montana] where another 2 inches of snow fell late this week, landing on the 8 feet still on the ground. And as the snow-fed Missouri crosses Montana, it’s collecting record rainfall, too. Some areas received 10 inches in three weeks; 3 inches fell on a town in northeast Montana between Thursday and Friday. The rain is expected to continue through the weekend. An even stronger storm system could surface next week. [I]n Pierre, South Dakota, the Army Corps announced it’ll raise releases at the Oahe Dam [a second dam] another 10,000 cubic feet per second this weekend. That will bring it to 160,000 by Sunday. “We are transferring flood storage from Oahe and Big Bend to Fort Randall, which has more storage available at this time,” said Jody Farhat, chief of Water Management, U.S. Army Corps of Engineers, Northwestern Division. “The amount of rain has nearly filled the reservoirs, doing away with most of the flexibility we had built into our operations for this year,” said Farhat. The State of Vermont has denied relicensing to the Vermont Yankee Nuclear power plant. But Senator Sanders says that 100% captured Nuclear Regulatory Commission has pressured the Department of Justice to sue the state to allow relicensing, and to side with the nuclear operator instead of the state. The Anshas Nuclear Reactor outside of Cairo has leaked small amounts of radioactive water. See this, this and this. Prefecture and city officials found that the operator had tampered with video images of the fire to hide the scale of the disaster. A top manager at the plant recently committed suicide, on the day that Japan’s atomic energy agency announced that efforts to recover the device would cost almost $21.9 million. And, like several other reactors, Monju lies on an active fault. Chubu Electric Power Co. said Friday that 43 pipes in a turbine steam condenser were found to be damaged at the Hamaoka nuclear plant in Shizuoka Prefecture, after the utility last month probed the leak of seawater into a reactor at the plant. Two other pipes were found to be deformed, the utility added, without elaborating. On May 14, some 5 tons of seawater entered the No. 5 reactor at the plant in the city of Omaezaki, following the discovery of around 400 tons of seawater in the condenser, which cools steam from the turbine and turns it into water. The trouble occurred during work to put the reactor into a state of cold shutdown, according to Chubu Electric. At that time, about 530 tons of water were flowing per hour through the recirculation pipe for adjusting the water volume inside the reactor. As the recirculation pipe had a fracture on its welded part near the lid, water that gushed out of it possibly damaged the pipes, the utility said. Japan is dangerously contaminated by radioactivity over a far larger area than previously reported by TEPCO and the central government according to new reports from multiple sources. The prefectural government of Iwate released new data that shows radioactive contamination of grass exceeds safety standards at a distance of 90 to 125 miles from the damaged Fukushima nuclear power plants. The prefectural government found on Tuesday radioactive cesium exceeding the limit of 300 becquerels per kilogram in grass collected from pastures in four areas, including Tono and Otsuchi. The areas are located about 150 to 200 kilometers north of the Fukushima nuclear power plant. 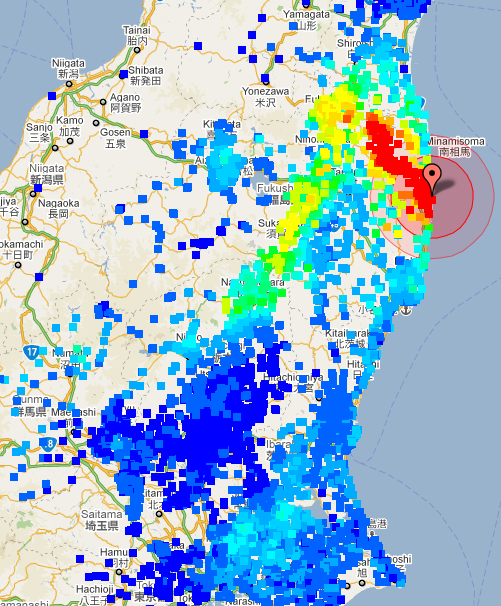 A map of citizen measured radiation levels shows radioactivity is distributed in a complex pattern reflecting the mountainous terrain and the shifting winds across a broad area of Japan north of Tokyo which is in the center of the of bottom of the map. Radiation limits begin to be exceeded at just above 0.1 microsieverts/ hour blue. Red is about fifty times the civilian radiation limit at 5.0 microsieverts/hour. Because children are much more sensitive than adults, these results are a great concern for parents of young children in potentially affected areas. I’ve previously noted that some Japanese tea is contamination with radiation. And now, reports of radioactive tea shipped into other countries are starting to surface. The journal Nature notes that the governments knew, but covered up, early knowledge about the release of radiation from Fukushima. Indeed, a 5.9 earthquake hit 110 kilometers from Fukushima today. Note: There are also a number of decommissioned nuclear facilities around the world which are alleged to have been leaking for decades, such as the Sellafield processing plant in the UK and the Hanford nuclear site in the state of Washington.